John was the founder of Trinity HOPE, beginning the ministry in 1999. While visiting Haiti on a mission trip, he witnessed one school where the children were disengaged in the learning process and very lethargic. He was told the problem was hunger…those kids were coming from homes where the parents weren’t able to feed them. John committed to begin a feeding program at that one school of 42 children in 1999. Through God’s abundant blessings, John and his friends kept raising money and kept feeding more and more schools. 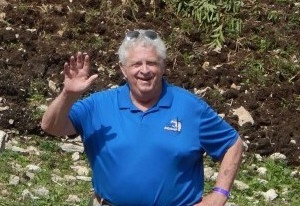 As John would say many years later, “God told me to start feeding those kids, and he has just never told me to stop.” Under John’s leadership, Trinity HOPE served more than 26,000,000 meals throughout Haiti prior to his death in November, 2016. Keith has worked extensively with the ministry since 2006. For the vast majority of his first ten years, he worked as a volunteer, under the leadership and mentorship of John Hall. During this time Keith also owned and operated his own business in the middle-Tennessee area. In 2016, after selling the business, God opened the door for Keith to transition his career to where he could join the ministry as a full-time employee. Keith and Beth have been happily married since 1987, and they have two wonderful daughters (Kyra and Brenna). He has a heart to use the gifts God has given him to serve others and share the love of Christ. Over the years, Keith has taught junior-high Sunday School, led and participated in men’s Bible studies, been a church elder, and been involved in personal mentorship relationships. Denise is our Operations Manager on the U.S. side of our work, keeping our donors informed and utilizing the many varied skills God has given her to help the children in Haiti. She and her husband Mark have three grown children and two grandchildren. Her passion for children is deep, as evidenced through her years of service to the youth at church or seeing her playing with the children in Haiti. Denise has worked for Trinity HOPE since 2012 and has made annual mission trips to Haiti to see the program in action. All our programs in Haiti are run by local Haitians. We have 16 dedicated Feeding Program Directors that are responsible for overseeing the feeding programs in their districts. They are very Godly men that are Christian leaders within their church, community and families. They take pride in their work and love the children they serve.